Controlled Devices. Digital Printing & Thermoforming. Thermoforming and digital printing offer a cost-effective, innovative signage solution that is also used in industrial markets like building and construction, transportation, and medical facilities. The process of thermoforming involves placing a plastic sheet into a thermoforming device, which stretches and molds to the desired shape when heated. Before investing in a thermoforming device, manufacturers and print providers should consider distortion software and heat control elements for accurate designs. Before digital print technology, most plastic printing in the thermoforming industry was completed with silk screening. This process wasn’t as efficient since it typically involves a different screen for each spot color—resulting in many screens. 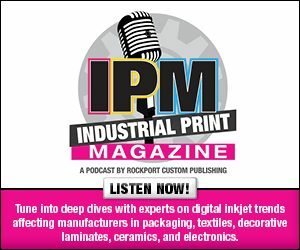 “Even if you are printing a four-color process—CMYK plus white—it is still five screens,” says Nic Neath, sales director, Formech Inc. Silk screening also creates registration challenges and requires solvent inks to dry between each color application. The arrival of digital printing eliminated the need for screens, creating little difference between a run of 20 and 200. Additionally, faster speeds reduced turnaround time and strong smells often associated with solvent inks. Today, several industries and applications are suitable for digital printing and thermoforming. Many sign companies already using digital printers are often candidates for investing in thermoforming equipment. “Digital printing is ideal for small and large runs and can be more cost effective for multi-color designs,” comments Neath. For these same reasons, digitally printing substrates for thermoforming is also popular in point of purchase displays and chocolatier products. “Edible inks can be pre-printed onto thermoformed moldings and then transferred to the chocolate,” adds Neath. Digital printing for thermoforming presents challenges in ink development. The process requires stretchable inks to avoid cracking during the forming process. According to Neath, printing on the substrate’s surface also risks ink sticking to thermoforming tools, making it difficult to remove the formed part. In this case, special release agents may be required. Aside from ink development, other elements like tool height can impact the printed artwork. For example, substrates can be overstretched to fit the shape of the thermoforming tool, resulting in a distorted pattern. If the artwork design is a random pattern, like leaves, Neath says the distorted print will probably still be visually acceptable. The critical areas for processing pre-printed substrates on thermoforming machines include consistent cycle times, precise heating control, and registration. Consistent cycle times are important to thermoforming devices because any variation in loading one cut sheet to the next can impact accurate reputable printed thermoforming. “Thermoforming machines that use reel feed material are less likely to suffer from these issues because it is a fully automatic cycle without any manual human intervention,” says Neath. Precise heat control in all sheet areas reduce the chance of distortion and inaccuracy. If the print design is created with distortion software, Neath says the device needs to provide even heat across the entire surface. Any variation in the heating temperature can result in the substrate becoming more fluid and the print moving out of registration. “Most modern heating banks consist of multiple heating elements divided into heating zones. The more the heating area can be split into smaller zones, the better,” he explains. Fine tuning registration ensures the machine operator has a system that quickly loads sheets accurately and consistently. For digital printing, Neath suggests a device with an indexing system on the X and Y axis where the substrate can be placed against adjustable guides or if preferred the substrate can be pre-punched and then placed over pins. The newest advancements in thermoforming devices offer full temperature feedback, heating pyrometer features, and quartz heating elements. Thermoforming devices are now designed with features for full temperature feedback. For example, a thermocouple can be placed in every element to provide a digital temperature readout that shows the exact temperature of that element. Additionally, Neath says desired target element temperatures can be displayed and then maintained more properly. Heating pyrometers are also new features to ensure consistency. A heating pyrometer is a sensor that is usually embedded in the heater’s center, pointing down at the substrate’s surface. “The sensor will read the precise temperature of the sheet and it can then automatically trigger the next operation of the machine when the correct substrate temperature has been reached, ensuring consistency in the formed product,” shares Neath. Quartz heating is a type of radiant heating that uses infrared waves to directly heat object surfaces. According to Neath, there are two aspects of quartz heaters that are appealing especially for digitally printed thermoforming—standby feature and quick reaction times. The latest advancements in thermoforming devices ensure products are produced accurately and consistently. Precise heat control and registration are key areas in avoiding distorted images. Part two of this series features a roundup of available thermoforming devices. Click here to read part two of this exclusive online series, Plastic Heating.